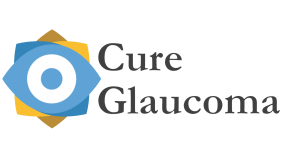 Diagnosing glaucoma is accomplished by examining the optic nerve and its ability to transmit the visual message to the brain. By determining whether or not the optic nerve has been damaged and whether the damage is getting worse, your eye doctor can diagnose glaucoma or determine the stability of disease. Various tools, techniques, and instruments will be used by your ophthalmologist to aid in your care. The optic nerve can be readily examined in clinic using an instrument called an ophthalmoscope. The optic nerve exits through the back of the eye. The nerve is made up of more than one-million individual nerve fibers which originate in nerve cells located in the retina (the light-sensitive film coating the inside of the eye) and travel to various places within the brain. When looking into the eye, the optic nerve is seen end on (optic nerve head), and the nerve fibers are faintly seen to fan out onto the retina. In the normal state, the optic nerve head looks much like a doughnut, with the outer ring consisting of the nerve tissue. The hole (called the optic cup) is the empty space within the central nerve head which remains after the nerve fibers fan out into the retina. In glaucoma, the nerve fibers are damaged and erode away, leaving a larger cup (or hole of the doughnut). As shown in the optic nerve photograph, a normal optic nerve head has a thick outer ring of nerve tissue with a small optic “cup” centrally. 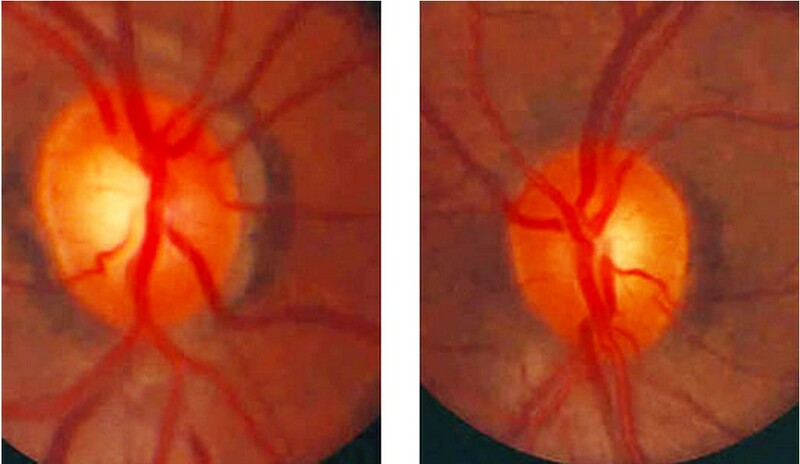 In the glaucomatous optic nerve, the outer ring is thin and the “cup” is larger, corresponding to the loss of nerve fibers. Although many different diseases affect the optic nerve, the damage from glaucoma has a characteristic appearance that permits your ophthalmologist to recognize whether glaucoma is present. Fundus photographs are performed to aid in following a patient suspicious for glaucoma or those patients with actual glaucoma. 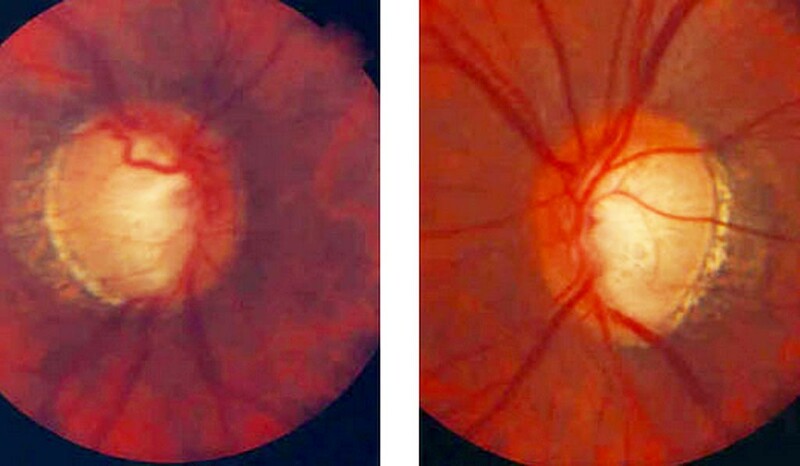 By photographing the optic nerve at a particular point in time, doctors can compare future examinations to the photographs taken previously. 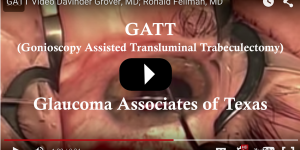 This comparison is invaluable in determining optic nerve progression and deciding on medical and surgical therapy for glaucoma. 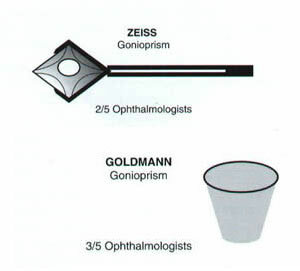 Gonioscopy is the use of a goniolens and a slit lamp or operating microscope to view the anatomical angle formed between the eye's cornea and iris. Read more about direct and indirect gonioscopy. The optic nerve is composed of over one-million individual nerve fibers/axons. Since the axons of nerves cannot be measured accurately in a live eye, indirect measures of axons (axon “counting”) must be used. Optical coherence tomography (OCT), GDx Analyzer (short for Glaucoma Diagnosis Analyzer), and the Heidelberg Retinal Tomography (HRT) are currently used in clinical practice. Currently, OCT is the most popular technology used by glaucoma specialists for optic nerve fiber analysis. 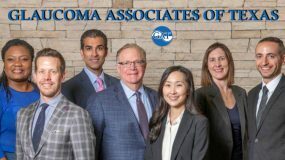 Both OCT and GDx are available at Glaucoma Associates of Texas. 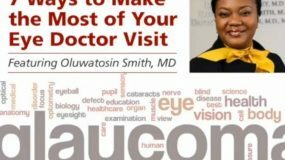 Perhaps the most important tool used to assess optic nerve function, determine whether glaucoma is present, and the status of glaucoma is the visual field test. This test measures how well the optic nerve functions in carrying visual information to the brain. Visual field tests measure the ability of the patient to see light at various points within the retina. Read more about Visual Fields. 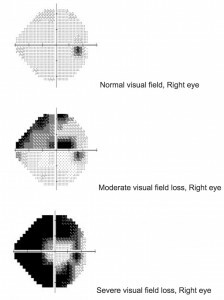 Most patients dislike having their visual field tested as the test may be long, tiring, and boring. It is not uncommon to feel that you have performed poorly on a visual field test. Modern visual field machines continue testing each spot measured until the patient misses, in order to determine the dimmest light detectable. Therefore, missed lights may be perfectly normal and should not cause one to be upset.